Join Keiko for a market tour of the famous Tsukiji market, followed by a hands-on cooking lesson in her kitchen. You will explore the outer market of Tsukiji, where Keiko will introduce you to her favorite vendors and point out some of the more popular stalls and shops. She will also give you tips on choosing the freshest produce and you may even get to try some local snacks. 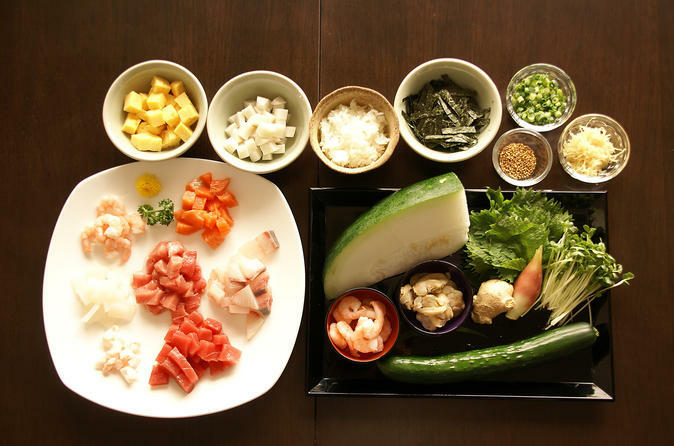 In your cooking class, you will learn to use almost 20 different ingredients as you prepare authentic Japanese cuisine. Once the food is ready, you will sit down together with Keiko to share the meal you helped prepare. Meet Keiko at Tsukiji Station on Hibiya line and walk to the famous Tsukiji market, where you will learn about Keiko's favorite vendors and ways to chose the freshest produce. The tour will last about an hour and does not include the inner seafood market as it typically shuts down activity by 10am. After the tour, join Keiko in the kitchen of her luxury apartment for a hands-on cooking lesson of seasonally-inspired Japanese dishes. Keiko values fresh and seasonal fish and vegetables, so your menu may vary according to season. Your traditional, seasonally-inspired Japanese style meal may include dishes such as sashimi donburi in a bowl, seasonal fish (slow cooked or grilled), soup with dashi, ohitashi of seasonal vegetables or seafood and vegetable stew. The cooking portion of your experience will last about 1-1.5 hours after which you will sit down together with Keiko to share the fresh meal you helped prepare. Keiko is also a qualified hand-crafting teacher and makes beautiful crafts using recycled kimono textiles and traditional plates and bowls. You will get to see her works on your visit and are welcome to enquire about the prices if you're interested in purchasing any.